After all of the Christmas activities, it's nice to have a bit of a break and take advantage of doing absolutely nothing. And this is exactly what I am doing today -- nothing. I had a huge sleep-in and am on my third cup of coffee. The perfect morning... Actually, at some point I do need to venture outside to hunt for the perfect NYE dress. We will be going to a nice dinner party, so some classy sparkles are in order. And since I've left it to the last minute, I can no longer buy it online (Eek!). Clearly, this is a pretty huge dilemma, so if anyone has any suggestions of a good spot for party dresses in Vancouver, please let me know! Another on of my new favourites is this pretty necklace by Olivia Solie Jewelry. I love simple items like this that you can wear everyday. There is something so appealing about triangles and the best part is the little cross that is stamped into the bronze (you can just make it out in the close-up). I got some earrings in the same style and I love the little details like this. She sells her jewelry at XO Bella in Kits and online here. I loooove the coat - such a statement piece! And you look absolutely gorgeous in these photos! Good luck with your NYE dress hunt!! I'm sure you'll find the perfect piece! Lovely photos! Love the coat! You look awesome! love your pants and leopard booties! Such a wonderful look, I like all the embelishments of your top! Zara coats are amazing... I've had one for three years now that I still wear! Love the layered look of that one... it really does look like you've put a leather jacket under a coat with shorter sleeves! Love the sleeves ! Very chic! Gorgeous!! Love your coat :) Happy new year!! I love the jacket! The quilted detail is so perfect and it totally looks like perfect layering. Have a wonderful NYE! Great pictures!!! I love the jacket... haha you are a master of layering because you bought it :)...Good luck with your dress. Happy New Year! 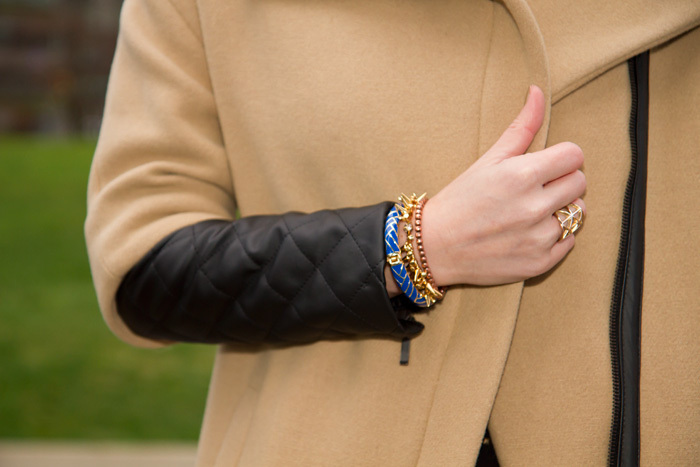 The leather sleeves on your jacket are so unique! Definitely a winter staple item!..... Happy New Year! Perfect outfit :) follow each other? i love the coat! happy new year darling! The layered look of that coat is awesome. What a great grab! Love the jacket and your blouse also. Here Zara sale starts the second or third week of january. Im waiting for it. Beautiful coat, I can see why you couldn't wait to have it! It look amazing on you! Love those booties too! Love this look!! Those boots are perfect with that top and I love your jacket.